Commemorate your favorite newlyweds' special day when you present them with one of these engraved Personalized Picture Frames! They'll cherish this gift celebrating their marriage for years to come. Our Silver Engraved Customized Picture Frames were designed with a non-tarnish nickel plated finish and is available in three different sizes, 4" x 6" , 5" x 7" & 8" x 10", with a black flocked cloth finish on the back. This photo frame includes a two- way easel for easy display. Includes FREE personalization. 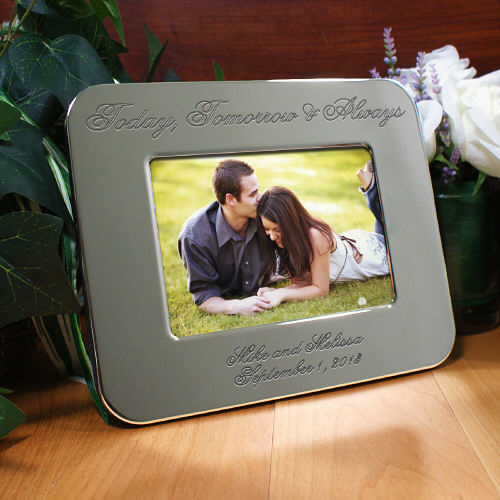 Engrave your Silver Wedding Picture Frame with any two line custom message and picture frame orientation of horizontal or vertical. This is one personalized wedding gift that the happy couple will cherish for years. They can display their favorite photo of their special day in their new home in this beautiful, personalized frame. This Our Wedding Day Personalized Throw Pillow is another great gift to give to the couple commemorating their big day!